Extraordinary things were happening on our planet 5,000 years ago. There was a major climate change, and flooding, and this was followed by the rise of advanced civilisations. However, there is another fascinating side to this story and its been a major influence on many aspects of human life ever since. The Sumerians, who arrived in Southern Iraq around 5,000 years ago, were more advanced than people already living there and civilisation rapidly took off . Villages expanded into towns and towns into cities. The Sumerians were a major influence on other cultures in the region but what was it that caused them to immigrate ? Well, according to their scribes, they were survivors of the Flood and, after leaving their original homeland, they stopped at a land called Dilmun which is generally thought to be Bahrain. (10) Nobody knows where they originated. Was it a land that’s submerged beneath the Gulf or was it somewhere further away say in the direction of the Indian sub-continent ? According to the Sumerian scribes, the Flood was caused by certain divine beings called the Annunaki, or Annanage (‘The Shining Ones’), who, many alternative scholars believe were aliens. These entities, who were first seen on the summit of a mountain, above a place called Kharsag, helped civilise man and taught people agriculture, and various useful arts. The reason why they later destroyed mankind, with a flood, was because people had become evil. Although not generally mentioned by name, but identifiable by their number and high status, the leaders of the Annunaki were revered as gods in many early Middle Eastern cultures and in later years, various people claimed them to be the ancestors of their tribe or sometimes heroes. (11) This group of ‘gods’ appeared in Egyptian religious traditions and they were alluded to in the symbolic layout of a secret underground complex near the pyramids at Giza. (12) More on this later. One of Sumeria’s chief gods , who was claimed to be the ‘ Civiliser of Man’, was known around the world under a variety of names. According to early legends, he had the appearance of a tall white, white, bearded man and he dressed in long white robes and, sometimes, he wore white sandals. Some people said that he caused the Flood whilst others said that he helped rescue the survivors or they didn’t associate it with him. The Sumerians called him Ea, or Enki , and they showed him in the form of a horned, bearded, man. The Dogon, in West Africa, know him as Lebe and, like all other civilisers, he is linked with agriculture. The Egyptians called him Osiris and although they associated him with agriculture, they also made him the god of the dead and every Egyptian hoped to be united with him when they died. According to early Egyptian legends, after leaving Egypt, Osiris and his companions set off to visit other countries. China’s earliest recorded civilisation dates back 5,000 years to the Long Shan culture which spread along the Pacific coast. The Long Shan were more advanced than their predecessors and instead of scattered villages, they lived in walled towns and herded sheep, cattle, and goats. Waves of settlers began to arrive in Korea and built villages especially on the coast. Korean medicine dates back to this time as do advances in fishing and weaving. Around 5,000 years ago, some of Taiwan’s native people arrived on the island. According to the Ami tribe, their ancestors previously lived on another island, east of Taiwan, but they were blown onto its coast by a terrific storm. (14) Another Ami legend tells of a frightening time when a boiling flood occurred after an earth-opening earthquake and the eruption flooded the whole Earth . (15) According to Vaughn M Greene, ‘there are many indications that ‘China, like Japan, was visited by astronauts who set up a ruling class. In 3000 b.c. that strange period when so many ‘Gods’ were walking the earth’, he adds, ‘ a ‘bearded white’ man named ‘Tai-Ko Fe-Kee’ came to China’. Greene says that he taught the people arts and agriculture and gave them their calendar. (16) I haven’t found any mention of him anywhere else but the story is worth repeating. China also has legends of a great flood and it’s generally dated to around 4,200 years ago. However, as we have seen, there were advances in civilisation, in this region 5000 years ago, as well as in many early cultures, and they occurred in the era of the Great Flood. A highly advanced civilisation, which spread over 300,000 square miles, arose, and expanded, in the Indus River floodplain around 5,000 years ago in what is now north-west India and Pakistan. Its cities were well built with brick and stone and its people had a system of writing. The identity ,and place of origin, of these people is unknown but it’s worth noting that the present Hindu Age, Kali Yuga, began in 3102 b.c.e when there was climate change, and flooding, in many parts of the world and when the Sumerians arrived in Southern Iraq. And it’s also interesting that one of the versions of the Indian deluge story suggests that the ‘Celestial Rishis’, who are identifiable as the leaders of the Annunaki, were involved in the rescue of a highly regarded man, Manu, who was also a seer (17) and one of the many counterparts of the biblical Noah. The Late Archaic period, in North America, began in 3,000 b.c.e, around which time there was an increase in population in parts of the continent, such as on the North-West Pacific coast, and when cultural development and trade expanded. Whilst scholars believe that the ancestors of all the Native Americans crossed over the Baring Straits from Asia thousands of years ago, many of the indigenous people say that they came from a lost flooded land. There were flood legends throughout North America and some Native Americans say that when the flood came, their ancestors fled to high hills. Others claim that they sheltered underground in caves. L.Taylor Hansen collected Native American legends about the visit of a great civiliser. Some people were said to have called him the miracle worker, or prophet or healer, and they stated that he wore a long white robe. (18) The Mandan Indians said that he was their first ancestor, and a great civiliser. They also said that he wore clothing made of milk-white wolf skins and that he ‘preserved them from the Flood’. (19) The Ojibwe called him Manaboza, or Michabo, and they also knew him as The Great White Hare because of his dazzling white appearance. Manabozho had supernatural enemies who destroyed the world with a flood but he protected the survivors and made the water depart. The North American Hopi have a legend about things that occurred after the Flood and which involved their Bow clan. (23) This story refers to their stay in certain caves and which also happen to be the ‘place of origin’ of some of the Central American Native peoples. The reason why nobody has ever been able to find these caves is because they don’t physically exist. This is an allegorical story, that’s featured in the Mayan creation legend ,and it dates back to 3114 b.c.e the beginning of the present age, in their calendar. (24) These caves are represented in the form of sacred architecture in some Mayan cities such as Chichen Itza (25) and practically the same symbolism was built into the above mentioned secret underground complex in Giza in Egypt. The Maya had a group of ‘creator gods’ identical in number to the leaders of the Annunaki, and some of their traditions, record in the Popul Vuh, would not be out of place in Ancient Sumeria. The Native peoples in Central America also had traditions of the great civiliser and he appears to be the same entity who features in the legends of the tribes in the North. The Aztecs called him Quetzalcoatland the Maya Kukulcan both of which mean ‘feathered serpent. He was not a serpent-god, though, as some scholars suggest, for many of the Early World civilisers were associated with a snake such as Osiris in Egypt and the Dogon Lebe. When the Spaniards arrived in Mexico, people thought that the white bearded god had returned with his companions. How wrong they were. Brazil is the largest country in South and Latin America. It’s bordered by several other countries and it has tribal people living in its jungles. Over recent years, researchers have been discovering some of the fascinating mysteries of its past. Several years ago, two rows of six pyramids were spotted on a satellite imagining map in its jungle, near the eastern side of the Andes range, and numerous pyramids, built from sea shells, by unknown people, have recently been found on Brazil’s southern coast. The oldest ones have been dated to the critical era around 3000 b.c.e. when the world was in upheaval. Traces of other lost civilisations have also been found in the jungles of Brazil. Around 5,000 years ago, around the time of the major El Nino event, settlements began to appear on the coast of Peru and there was a surge in monument building. There are also early signs of agriculture along the Supe river valley and at Aspero, near its mouth, an unknown people built large platform mounds. Over the years, several advanced civilisations arose in various parts of Peru the last one being the Incas who established the largest empire in South America. In a tradition, which appears to have been inherited from other Peruvian people, the Incas also had legends about the great civiliser. They described him as being a white, bearded, man who wore a white robe, fastened at the waist, and who carried a staff. The name that they gave him was Viracocha. According to legend, he destroyed a race of giants, which he had created, with a flood and he then created man in his own size. In another Inca story, he appeared after a period of darkness and began to create the landscape and the heavens. He also gave life to man. 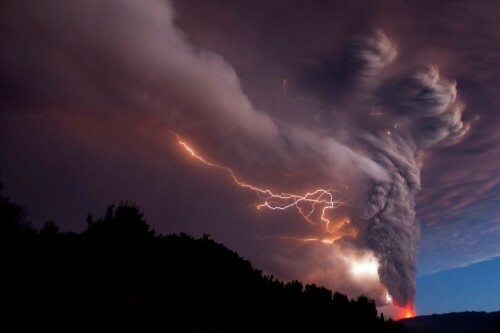 Were the black skies caused by the worldwide increase in falling ash in 3100 b.c.e’? The Hawaiians had a god who they associated with agriculture, rainfall and fertility. They called him Lonoand they represented him with ‘white bark cloth’. Capt.Cook, the 18th century British explorer, arrived in Hawaii at the time when his return was expected. Cook was mistaken for the god and the people gave him a rousing welcome. However, he was killed when he later returned and when the Hawaiians discovered their mistake. Five thousand years ago, something incredible happened on this planet. Legends suggest that there was an extra-terrestrial visit to Earth and that among the visitors was a tall white, white bearded, civiliser being who wore a long white robe and who, with his companions, travelled around the world meeting its people. This being taught people agriculture, and many useful arts, and although not mentioned in this article, various sources associated him with the Pleiades. Whilst the visors were here, there was climate change, and flooding, in many parts of the world. The people blamed the Flood on them and said that they had punished mankind for being evil. After The Flood, civilisation was reborn, in different countries, and many tribes began to settle into new lands. These incredible events, and the E.T visit, had a major impact on human life. Numerous versions of the sky-god religion were spread around the world as were hundreds of allegorical deluge stories many of which have been taken literally. 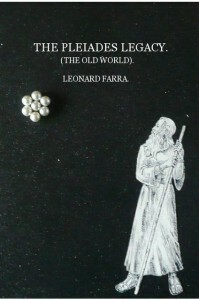 (32) And since there were remarkably similar sky-god religions on both sides of the Atlantic, it would seem likely that there was contact between the Old and New Worlds long before Columbus arrived in the Americas. Furthermore, if there was an extra-terrestrial visit to this planet 5,000 years ago, then there is no reason why it should not be happening again in the present. Proofs of Cataclysm. George Mitrovic. Charles Squire. 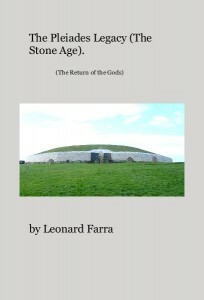 Celtic Myth and Legend. (p139)Gresham Publishing Company. 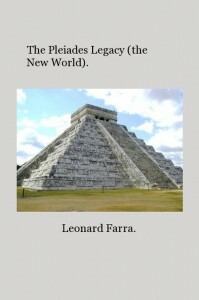 Leonard Farra.The Pleiades Legacy (The Old World) ( p235) Blurb.2010. Geoffrey Bibby. Looking for Dilmun.Penguin Books. 1984. R.Hope.Classic Myth and Legend. (p206) Gresham Publishing Company. Edmond Sollenger.The Babylonian Legend of the Flood (p16)British Museum Publications Ltd. 1971. Cherokee People.Thomas E Mails.Council Oak Books. 1992. Joseph Ellul. Malta’s Prediluvian Culture (p6) Printwell Ltd. 1988. G.Brinton.Myths of the Americas (p199) Multimedia Publishing Corp.
A.Mackenzie. Myths of Melanesia and Indonesia (p341) Gresham Publishing Company. Lorraine Mafi Williams.1989/90 Ley Hunter Magazine. And Lord Krishna in Bhagavan Gita statement was Right : and waters were rising , when He left His body…somewhere in 3030 BC.